These Keen 13035K stainless cut-off wheels provide users with (25) individual discs. These high speed cut-off wheels are suited for applications in metal and stainless steel, providing a rate of up to 25,150 rpm/100m/s. Each disc measures 3-in diameter with a 1/16-in thickness. These Type 1 wheels have a thin, efficient kerf for faster removal. 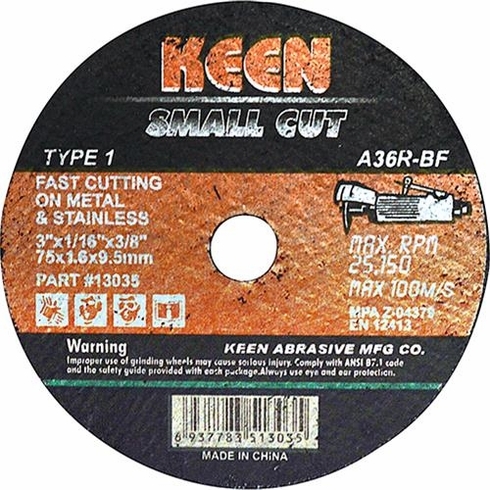 These Keen cut-off wheels have an arbor size of 3/8-in.